When U.S. Secretary of State John Kerry sat down in Jeddah, Saudi Arabia, on the 13th anniversary of 9/11, surrounded by the leaders of 10 Arab states, to build a coalition against Islamic State (ISIS), the scene dripped with irony. For decades, Saudi Arabia and Qatar, along with Arab billionaires in Gulf Arab states, have financed the breeding grounds of Islamic extremism in the tens of thousands of madrassas spread around the world, from Philippines to Philadelphia. Take the case of the al-Shabab leader Ahmed Abdi Godane, whose death President Barack Obama boasted about at the Wales NATO summit as an example of America's approach to dismantling al-Qaida-affiliated groups. What Obama failed to mention was the fact Godane became a jihadi terrorist only after obtaining a Saudi scholarship to study radical Islam at madrassas in Sudan and later Pakistan. Assuming the objective of the American/Arab coalition was to fight the misogynist murderers of ISIS, it was also ironic not a single woman sat at the table. Not even a female State Department staffer or assistant. This was not a coalition that will defeat ISIS; it was a coalition that will end up reinforcing Islamic State as the one true answer to the crimes being committed against the Arab people by its own leaders. Islamic State is being formed exactly the way Saudi Arabia was formed when thousands of bloodthirsty jihadis rose from the Sultanate of Nejd and invaded the Kingdom of Hejaz, slaughtering the country's citizens into submission in 1925. Remember, Saudi Arabia is a kingdom where the king had his own daughters held hostage to force their mom, his runaway wife, to return. Then we have Turkey as a NATO ally sitting in on secret meetings where the West bungles its way trying to figure out the difference between "strategy" and "tactic". As the New York Times disclosed today "one of the biggest source of (ISIS)recruits is neighboring Turkey, a NATO member." The challenge posed by ISIS will not be resolved with the American airstrikes or by British Prime Minister David Cameron's declaration echoing George Bush's cliched chant that, "Islam is a religion of peace". 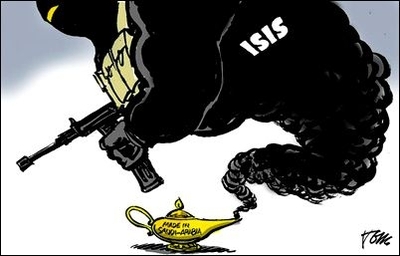 This will merely strengthen the jihadis' resolve and make more Muslims turn to ISIS. As for Islamic leaders in North America and Europe, they should stop their exercise in "Muslim patriotism" and for once speak the truth.